Like the gem, the limited production Diamond Crown Black Diamond cigar is equally rare and worthy of your attention. With never-before-used filler and binder tobaccos grown in the far reaches of the Fuente family farm wrapped in Connecticut Sungrown leaf aged no less than 5 years and meticulously fermented, the Black Diamond cigar is stunning to behold and exceptional to smoke. Exceedingly rich and complex, the flavors of aged tobaccos at the cigar's core are complimented by sweet, spicy, woody, and earthy notes. Hand crafted with the utmost care at Tabacalera A. Fuente y Cia in the Dominican Republic, these cigars are packaged in glossy black humidor boxes protected inside embroidered black velvet pouches. 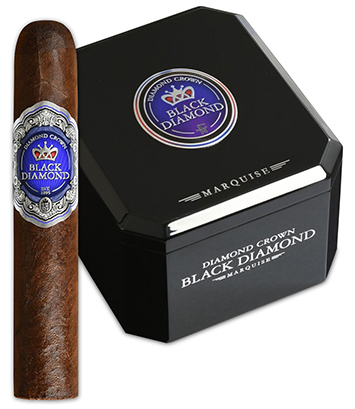 Milan Tobacconists is proud to be a Diamond Crown Cigar Lounge and one of the first retailers in the world to sell the Diamond Crown Black Diamond line.